I swept up 2013 AS27 while performing NEOCP follow-up. The object I was looking up was listed as UABF97F on the NEOCP. Off the NE side of the images was a fast moving 18th magnitude unknown. I immediately turned in the object as lb4020 (my temporarily assigned designation) to the MPC. Within minutes it was posted on the NEOCP and after a few hours Bob Holmes of ARI (H21) provided the first of many confirmation observations posted from around the world. This makes the second Apollo Near-Earth Asteroid discovered at Sandlot Observatory in 4 months. 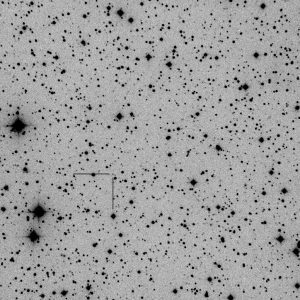 2012 SY49 discovered last September was a VI but was only about 20 meters or so in diameter. 2013 AS27 is a PHA coming as close as .034 A.U.s but is ~.25 KM in diameter. Here’s a website to check out a Planetary Society ‘Hangout’ webcast.